Objective: My objective for this viral content challenge was to create content that instills a sense of sympathy, humor, and stress relief among college students. I wanted to target the college audience that is in the age range of 18-23. This audience is hardworking and always looking for opportunities to do better. 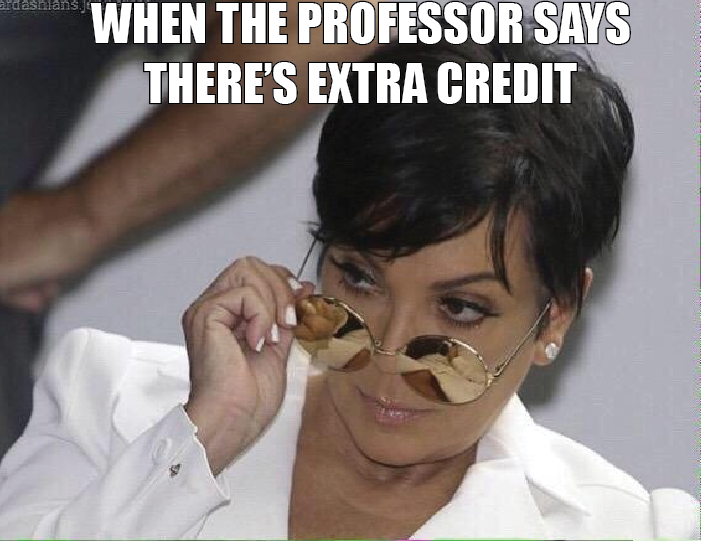 The purpose of my meme was to help students relate to each during a challenging time in the semester when they might be looking for extra credit from professors. Of course, my ultimate goal was to receive significant engagement on social media. I was hoping to get 15 Twitter likes, 2 Twitter retweets, and at least 300 views on Imgur. Analysis: After posting it the first time on, November 7th, I got some engagement and I believe people thought my meme was funny. But, the more I shared it, the less engagement I got. By the last day of the campaign I was getting zero likes. However, I think what worked well for me was sharing a lot of content on the first two days. I tweeted my web card around 2:00 p.m. on November 7th and the post got 8 likes, 1 retweet, and 1 reply. I tweeted my Imgur link at 5:00 pm the next day, November 8th, and that got 6 likes and 1 retweet. I also think coming up with witty copy encouraged my followers to like my tweet. I tried recycling my tweet by retweeting it but this was when I found that people were engaging with my content the least. I also noticed that after I retweeted my Imgur link I actually lost a follower.